Category I easements are the most protective type. They prohibit clearing of any tree, bush, or vegetation. They prohibit construction, paving or grading of the ground. They also prohibit the dumping of unsightly materials (trash, ash, non-biodegradable materials, etc). Diseased or hazardous trees or tree limbs may be removed to prevent possible property damage or personal injury, but only after a reasonable notice is given to the Planning Board. Category I easements do not prohibit entry into the easement; homeowners are allowed access in and out of the easement, but they are not allowed to alter the natural landscape. The standard Category I legal description is available to view at the County Circuit Court Land Records Department under Liber 13178 Folio 412 [PDF]. Not all Category I easements are placed over existing forest. The purpose of a Category I easement is to preserve and protect existing and future forest. In some cases, through the development process, it may be determined that a developer needs to meet their forest mitigation requirements through on-site or off-site planting. In these cases, an easement will be placed over land that isn’t currently forested. These areas are typically adjacent to existing forest, stream valleys, or other areas that can be enhanced by additional forest cover. Maintenance is required, such as mowing once or twice a year to keep weeds in check until the trees are large enough to shade them out. If there are no suitable areas on the property being developed, an option for developers is to select an offsite location for protection. 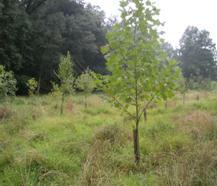 These easement areas can include both retention of existing forest and planting of new forest. Alternatively, developers can opt to buy into forest mitigation banks, which can involve retention of existing forest or planting of new forest at the bank location. Other types of Forest Conservation Easements also protect forest and natural features throughout the county. These easements were created prior to the enactment of the Forest Conservation Law in 1992. As a part of development, conservation easements were often required over sensitive natural land. Unlike standard Category I and II Conservation easements, these easements typically have varying allowances regarding the forest on a property. The language of some of them can be more protective than others, so each easement should be taken at a case-by-case basis. Generally, though, the purpose of each of these easements is to maintain and protect the scenic beauty and natural condition of the land through preservation of forest and other natural features. Category II easements are typically placed over an area that is not forest, but features large specimen trees that are desired to remain. In a Category II easement area, activities such as mowing and clearing of understory are allowed, provided they do not damage or kill the large trees covered by the easement. Similar to Category I easements, activities such as construction, paving and grading of land are prohibited. 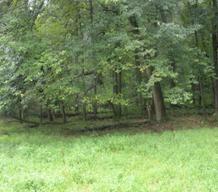 These easements are extremely important in protecting large trees that may not be inside forest area. The standard Category II legal description is available to view at the County Circuit Court Land Records Department under Liber 13178 Folio 421 [PDF].